About a month ago, a friend for whom I have a great deal of respect said that she doesn’t like Ōe Kenzaburō’s A Quiet Life. She argued, essentially, that the novel has no forward momentum and that she couldn’t bring herself to care about the characters, especially the narrator, whom she considered silly and a bit too passive. These are all genuinely valid criticisms; but, since I happen to rather like the novel (and since I haven’t read anything else that has caught my attention recently), I thought I might defend it a bit. 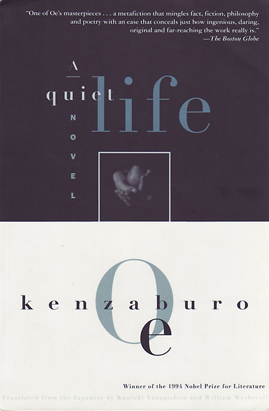 Of course, a book that labels itself with the title “A Quiet Life” isn’t for everyone, but I feel like there’s so much interesting stuff going on in the novel that the lives of the characters are anything but quiet. First of all, let me say that this novel does not fit neatly into Ōe’s other work. There is very little here that is overtly political (like Hiroshima Notes), very little having to do with Pacific War era ideological confusion in the forests of Shizuoka (like in the stories of Teach Us to Outgrow Our Madness), and exactly zero sleeping around with your former lover while your wife is in the hospital after having just delivered a baby that you are plotting to kill (à la A Personal Matter). Ōe’s oeuvre tends to be a bit intense, so I really appreciated reading something a bit more…quiet. Also, there’s a really cool film adaptation directed by Itami Jūzō, the guy who directed Tampopo (1985) and A Taxing Woman (1987). It turns out that Itami was Ōe’s brother-in-law, oddly enough. But I digress. A Quiet Life is about the author’s family. Ōe refers to everyone by nicknames, but the essential family structure is the same. A genius writer living in the suburbs of Tokyo tries to commit suicide, so his exasperated wife, who catches him in the act, persuades him to accept a year-long writer-in-residence position at a university in California. The couple leaves behind their three children, and the narrator, Ma-chan, is one of these children. She is twenty years old, writing her college graduation thesis on the interwar French writer Louis-Ferdinand Céline, and responsible for the care of her quick-witted younger brother O-chan and her mentally-handicapped older brother Eeyore. While O-chan comes and goes like the wind, Eeyore requires a bit more attention, especially as Ma-chan comes to suspect that he feels abandoned by their parents. A Quiet Life follows Ma-chan and Eeyore through the summer after their parents leave, with Eeyore attending music composition lessons, Ma-chan working on her thesis, the pair attending a funeral in their father’s home village in Shizuoka, and other various aspects of the family’s daily life. This daily life is spiced with such incidents as Eeyore’s capture of a neighborhood pervert, the composition teacher’s ventures into socialist activism, and Eeyore’s swimming lessons, conducted by a handsome young instructor for whom Ma-chan quickly develops a crush. Throughout the novel run Ma-chan’s thoughts and commentary on a variety of works of film and fiction, including Andrei Tarcovsky’s Stalker, the religious poetry of William Blake, and Michael Ende’s novel The Neverending Story, not to mention a forty-page rumination on Céline. I enjoyed these discussions, which were more often than not carried out in the form of lively conversations between Ma-chan and Eeyore’s music composition teacher, but I imagine how this sort of intratextual literary criticism might derail the forward momentum of the story for people who simply don’t care for that sort of thing in their fiction. In my opinion, however, the main point of the novel isn’t its plot or its intellectual discussions, but rather the development of the relationship between Ma-chan and Eeyore. The two are obviously close; but, when Ma-chan assumes the role of Eeyore’s primary caregiver and babysitter, she finds herself repeatedly frustrated with her brother. She suspects that Eeyore himself might be the neighborhood pervert, for example, and occasionally resents him for claiming the bulk of her parents’ attention and preventing her from getting closer to boys like the swimming instructor (who actually turns out to be a creep). Eeyore, despite his idiosyncrasies, has his heart in the right place and in fact turns out to be perhaps the most interesting character to come out of Ōe’s work. Ōe’s portrayal of him, both through his words and actions and through his sister’s perception of him, is both complex and sympathetic. Ma-chan may be passive (or she may simply be a normal if somewhat oversensitive twenty-year-old college student), but Eeyore is anything but, and he emerges as the real star of the novel. At a meta-textual level, I found not only Ōe’s portrayal of Eeyore but also his decision to use the voice of a semi-adult woman (modeled after his own daughter) for his narrator to be quite interesting. Is it realistic? Is it convincing? Why in the world would he choose to employ such a narrator? Regardless, Ma-chan is much more than the typical shōjo heroine, and A Quiet Life is much more than the typical home drama. The translation is smooth, and the narrative flows fairly quickly, jumping effortlessly from one tableau to the next. Although A Personal Matter will probably continue to hold the place of honor in the work of this Nobel Prize winning author, I feel like A Quiet Life is a close second. Part of what made Ma-chan appear passive to me comes through in your post. You say that she had a crush on the swimming coach, but I didn’t get that feeling at all. I didn’t feel as though she liked him, but I also didn’t get get the feeling that she disliked him. I had no clue why she did anything. Ma-chan just did not feel like an actual person to me. So if you say that she is much more than a typical shōjo character, I would counter that she is much less. The girls of shōjo are often silly and stupid, but only in the worst works of the style do I find myself wondering why characters act as they do. That bugged me through A Quiet Life, and the answer that I eventually came to was that Ma-chan was supposed to be abnormally passive. Even so, I don’t find her character believable. I do agree with you that the novel does a decent job of showing how un-quiet the most quiet lives can be. However, I’m happy to hear that the rest of his works are different. I found Ma-chan to be quite active. She was characterized as responsible, independent, ambitious, and quite intelligent and reflective, if sometimes a bit out of it. I saw a lot of myself as a college student in her, and the fact that sometimes she handles things passively and messes things up made her much more realistic in my eyes. Even though I found her to be a fairly realistic portrayal of a twenty-year-old young woman, I might also question the degree to which she is supposed to be mimetically realistic. The way that Ōe uses the textual body of his fictionalized daughter as his own mouthpiece at certain points throughout the text is quite interesting, I think. Why does he do that? What does having a young female protagonist allow him to do that he can’t do with this (overwhelmingly) male protagonists? And how does this connect with the shōjo phenomenon of the 1990’s? Or does it? Speaking of shōjo, I would say that my own holy trinity of shōjo consists of Sailor Moon, Cardcaptor Sakura, and Revolutionary Girl Utena. All three of these girls embody the ideal of a ‘pure spirit,’ and they are able to win victories by the power of their faith in love and in their friends. There are also reader/viewer stand-in characters like Yūki Miaka, who are unconditionally loved by everyone because of their pure hearts and their seeming inability to make the wrong decisions. Miyazaki’s early heroines Nausicaä and Sheeta are also powerful because they are so kind, open-hearted, and pure – they may be driven to intense emotion by extreme circumstances, but they still always make the right decision in the end. I don’t think Ma-chan is ‘a typical shōjo character’ because, to me, she is more three dimensional. Unlike Nausicaä, sometimes she makes decisions that are irrational or seemingly random. Sometimes I don’t understand my own decisions from when I was her age, so I was able to identify with her weaknesses as well as her strengths. If you didn’t like A Quiet Life, though, maybe you should still check out A Personal Matter, which is completely different in all respects. I think Ōe is a remarkable writer in the range of his subject matter and abilities, so hopefully A Quiet Life hasn’t completely prejudiced you against him. By the way, two of my favorite essays on shōjo are John Treat’s “Yoshimoto Banana Writes Home: The Shōjo in Japanese Popular Culture” (in Contemporary Japan and Popular Culture) and Ann Sherif’s “Japanese Without Apology: Yoshimoto Banana and Healing” (in Ōe and Beyond). Of course, the usual suspects (Napier, Orbaugh, and Kinsella) have written articles on shōjo in anime that I’m sure you’re already familiar with, but I really like the two essays on Yoshimoto, which deal with shōjo as a wider cultural phenomenon. The vast majority of the impression I have of ‘a typical shōjo‘ came from those two articles, if you’re interested.